I had the honor of getting to make the 2011 Maisie Kukoc Award. The award is given right before the Stumptown Comics Fest to an awesome mini-comic creator. It was presented at Guapo Comics in Portland. The winner, Damien Jay, wasn't able to be there, but he was called live and he was very surprised and a little confused to have a shop full of people calling him. The award is named after John Porcellino's cat and he makes King-Cat comics so the crown and kitty combo basically designed itself. 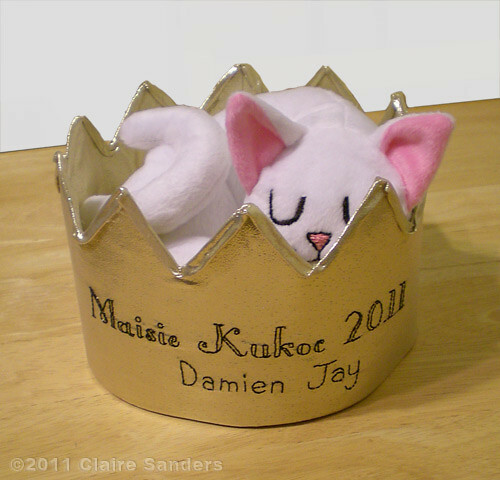 Although the cat is curled up inside, it still can be worn as a crown. The crown is made out of gold lamé, with an internal fabric stiffener to keep the crown shape. The kitty is made of a low pile plush, I did all the embroidery by hand. It was fun trying some new hand embroidery fonts as I usually just do my handwriting. There are more photos in my flickr.